in her words: Women’s March 2019: Having Trouble Keeping Up? Here’s What to Know. Days after the 2016 election, a small group of women — alarmed by the impending Trump presidency — got together at a New York restaurant to plan a demonstration. What resulted from that meeting, and many others like it, was the largest single-day protest in United States history, the Women’s March, which took place in about 600 American cities and towns and on every continent in the world in January 2017. It was an event that served as a catalyst for political change, helping to inspire a record number of women to run for office. 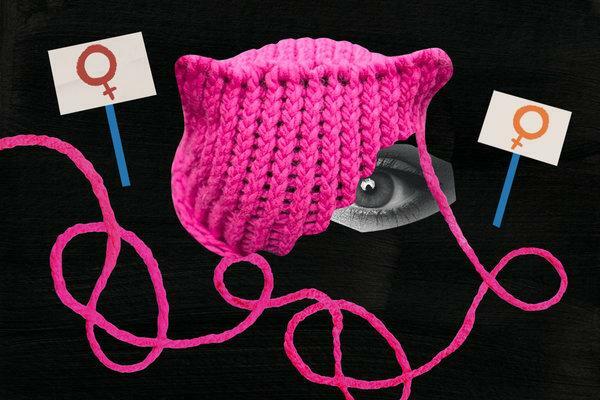 No social justice movement is without conflict, and disagreements around the Women’s March were there from the start: Should the march include anti-abortion women? Were the needs and priorities of women of color overshadowed by the priorities of white women? What about transgender women? On the eve of the third annual Women’s March — which will take place Saturday — charges of infighting and anti-Semitism are hanging over the event. At least one march has been canceled, in California; and in New York, two competing marches are taking place, their leaders at odds. Whether or not you’re planning to march on Saturday, here’s a breakdown of what’s been happening and what to expect. Recent articles in Tablet, a Jewish magazine, and The New York Times have renewed scrutiny of claims that some of the earliest founders of the Women’s March had made anti-Semitic remarks. In both articles, Vanessa Wruble, a Brooklyn-based activist and an early leader of the Women’s March, says her Jewish heritage played a role in her being pushed out of the group — charges that Tamika Mallory and Bob Bland, presidents of the national Women’s March, have vehemently denied. In recent weeks, Jewish groups and Teresa Shook — the first person to suggest the idea of a women’s march in a 2016 Facebook post — have called for the resignations of the leaders of the national movement: Mallory, Bland, Sarsour and Carmen Perez. Regional chapters of the Women’s March, civil rights groups and high-profile allies — including the Democratic Party, which until recently was listed as a supporter on the Women’s March website — have distanced themselves from the national entity. On Thursday, Women’s March Global, a group that organizes marches around the world, sent out an email underscoring that it had never been affiliated with the national Women’s March. Meanwhile, even the name “Women’s March” is causing conflict, with four organizations suing the national Women’s March organization over its efforts to trademark it. So what should I expect if I’m marching? The schism has resulted in two competing marches in New York: one led by the national Women’s March, which is billed as being led by women of color, and the other being organized by a group called the Women’s March Alliance, which is stressing its denunciation of anti-Semitism. The two groups discussed unifying in recent months, but the conversations broke down. Elsewhere, it seems that the protest on Saturday will go forth without much of a hitch, though fewer attendees are expected. The national group’s agenda this year is to transform its principles into policy at the state and federal levels — namely, advocating for the rights of immigrant women, the disabled and the L.G.B.T.Q. community, as well as ensuring pay equity. This year’s hashtag: #WomensWave. Like previous years, the central event will take place in Washington, beginning at 10 a.m. at the National Mall. According to the national Women’s March’s website, more than 100 marches are planned in cities around the U.S. and countries around the world, including Madagascar, Argentina, Zimbabwe, Bulgaria and Israel. That is how much less women who work for Citigroup earn than their male counterparts. Citibank employees of color earn 7 percent less than their white counterparts. The stat came from an unlikely source: Citigroup itself, which became the first bank in the United States to publish evidence of its gender pay gap. In 1858, The Times published a piece that railed against the proliferation of girls’ schools and griped about the “evils” of educating girls. “What an amazing sight is the spectacle of a stupidish girl of 12 or 14 going through her course!” the piece proclaimed. What might motivate girls to be as enthusiastic about sewing as learning history and math? Prizes for fixing holes in socks, of course!